Grateful: Nicole de Vries, pictured with Longreach parish priest Marist Father Robert Hollow and students, says herr time as principal of the town’s Our Lady’s Catholic Primary School has been a rewarding time. BECOMING a principal in the west is the opportunity of a lifetime, says Nicole de Vries, reflecting on her time leading Our Lady’s Catholic Primary School in Longreach. After two years there, Mrs de Vries will take up a leadership position in Maroochydore next year, but said she would miss the wonderful Longreach community and the warm, welcoming hospitality of the west. “People embrace you and are excited to share their home with you,” she said. 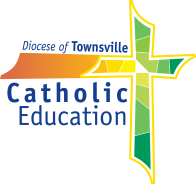 Catholic Education of Rockhampton diocese recently advertised principal positions at Our Lady’s and at St Joseph’s Catholic Primary School, Clermont, and Ms de Vries was quick to endorse the position to potential applicants. “Being a principal in the west has been extremely rewarding,” she said. “There are challenges, but these challenges enable leaders to make a difference in the lives of the students and their families. Mrs de Vries said connections between the school and parish were strong and this provided “a fantastic support network both professionally and personally”. “Rural towns are a hive of social and sporting activity – everyone loves to come together for community events whether it’s playing sport, going to the races, participating in charity activities or simply getting together for a backyard barbecue or to enjoy the great outdoors,” she said. “Modern, well-maintained accommodation and significant allowances make the overall package very attractive and there is tremendous support from Catholic Education so you are never alone. Catholic Education assistant director for schools in the Western Region Ross Jones said leadership positions in the west brought with them unique opportunities for professional development and an amazing opportunity to experience the charm, history and way of life in Australia’s iconic outback. “Leaders in western schools have access to well-established, strong professional networks and opportunities to gain skills and experience that are perhaps not as readily available in metropolitan centres,” Mr Jones said. “Mentoring and coaching new staff and making a real difference in the lives of families in rural and remote communities is tremendously rewarding. “These communities have a way of life all their own, combined with friendly people, spectacular scenery, amazing wildlife and a vibrant, social lifestyle. More information regarding principal vacancies in rural and remote schools in Rockhampton diocese is available on the Catholic Education website at www.rok.catholic.edu.au or by contacting the Catholic Education Office on (07) 4931 3600.